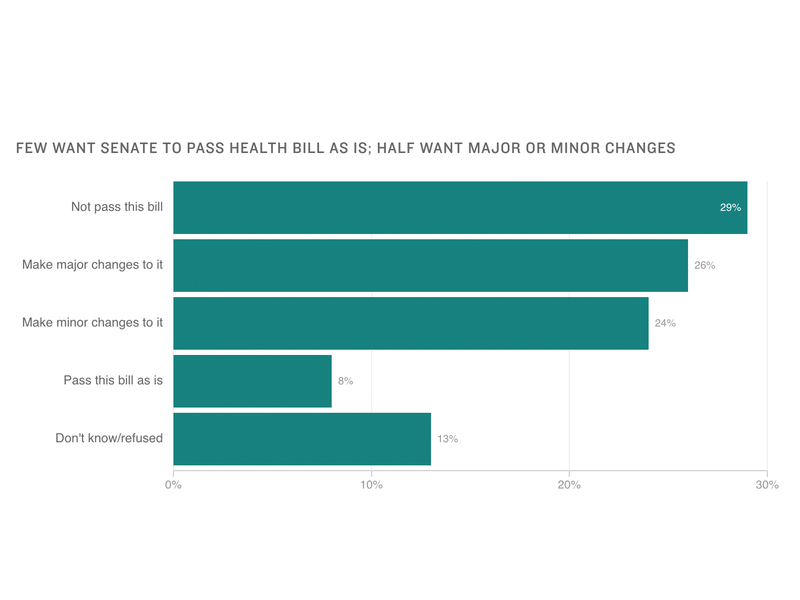 Poll responses to the question of whether the Senate should pass the American Health Care Act. When it comes to health care, Americans may be having buyer's remorse. The numbers come just as members of the Senate are hammering out details of their own health care plan. Republicans are looking to fulfill their years-long campaign promises to repeal Obamacare. It's just not clear that voters want them to do so. "This is the kind of information that they've been dreading," Joe Antos, a resident scholar at the conservative American Enterprise Institute, says of GOP leaders. "They could see the negative reaction that the House bill got, and clearly, they recognize that their job is to come up with something that will work better politically and, ideally, work better for the people that will be most affected." About 75 percent of those surveyed say the bill passed by the House doesn't fulfill Trump's promises on health care. Fewer than 10 percent of people say they want the House Republican bill passed as is. About 30 percent say it should not be passed at all, while another 26 percent say it needs major changes. The survey was conducted from May 16 to 22 among a sample of 1,205 adults living in the United States. The margin of error is 3 percentage points. When it comes to health care, Americans like the Affordable Care Act, or Obamacare, more than they like the House Republicans' plan to replace it. That's according to a new poll out today from the Kaiser Family Foundation. NPR's Alison Kodjak highlights the political danger for Republicans. ALISON KODJAK, BYLINE: Only about a third of Americans have a good opinion of the health care bill passed by Republicans earlier this month according to the new poll. Most Republicans like the bill, but they don't love it. Many said their opinion was only somewhat favorable. MOLLYANN BRODIE: What we're seeing this time around is that the support for the Republican plan is a weaker type of support than the opposition to it. KODJAK: That's Mollyann Brodie, who runs Kaiser's public opinion research. She says Democratic voters' support for Obamacare is much stronger than Republican voters' support for the Republican alternative. She also says people are becoming more pessimistic about the future of their health care. BRODIE: Right after the election, in December, when we asked people if their costs would get better or worse or their quality of care would get better or worse or access to care would get better or worse, you know, about a quarter across the board thought things would get worse for them. But those shares have now increased. KODJAK: Now it's almost half. Joe Antos says that's bad news for Republicans. JOE ANTOS: This is the kind of information that they've been dreading. KODJAK: Antos is a health policy researcher at the conservative American Enterprise Institute. ANTOS: There's no getting around the fact that the Republican proposal will have fewer people insured - could potentially lead to much higher costs. And those are very negative consequences of legislation that clearly isn't winning friends, even among Senate Republicans. KODJAK: The Congressional Budget Office estimates that if the bill passes, 23 million fewer people will have health insurance than if Obamacare stayed in place. That's in part because the Republican plan eliminates the requirement that people have coverage, and it cuts back on tax credits and subsidies that help people pay for health care. And it rolls back the expansion of Medicaid. The bill is now in the hands of Senate Republicans, and Antos says they'll take those poll results into account. ANTOS: Not only do Democratic respondents think that the things that are going wrong are really on President Trump's watch and he is responsible, but most Republicans (laughter) believe that too. KODJAK: And that's likely to be on senators' minds as they work out their own health care plan. Alison Kodjak, NPR News, Washington. Transcript provided by NPR, Copyright NPR.